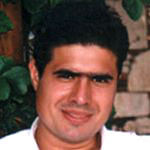 1997 - 2005: PhD student in the Department of Cell Biology and Biophysics, Faculty of Biology, University of Athens. Title: "Contribution in the study of substrate selectivity of the enzyme Dihydrofolate Reductase (DHFR). Structural and biochemical studies of novel inhibitors of the enzyme and their complexes." 1992 - 1997:Undergraduate studies in the Faculty of Biology, University of Athens. Diploma Thesis: "Structural studies of the plant lectin Concanavalin A (Con A)." My research interests are oriented towards the determination of structural features of proteins and small organic compounds by X-Ray crystallographic methods. At present my research is focused on structural studies of the enzyme Dihydrofolate Reductase. I am also interested in the determination of protein structures by comparative modeling, in cases where no experimental data can be obtained. Nastou, K.C., Tsaousis, G.N., Papandreou, N.C., Hamodrakas, S.J. (2016) MBPpred: Proteome-wide detection of membrane lipid-binding proteins using profile Hidden Markov Models. Biochim. Biophys. Acta Volume 1864, Issue 7, pp. 747â€“754. [Abstract] doi: 10.1016/j.bbapap.2016.03.015. Willis, J.H., Papandreou, N.C., Iconomidou, V.A., Hamodrakas, S.J. (2012) Cuticular proteins. Chapter 5 in Insect Molecular Biology and Biochemistry (ed. L. I. Gilbert) Academic Press pp. 134-166.